The ChemPlan project started out in 2002 as an Access application. I developed the application from the ground up. It was designed to track insurance quotes, policies, claims and loss control. In 2007 the process of converting this system to a web based application began. ColdFusion was used in the development along with Microsoft SQL Server. The application now included an elaborate Quoting system, with programmed checks and balances to ensure that all required data and documentation was present, including low-level document management and a calendar based communication system. The project was code named FRED! When I started working for Siemens Water Technologies in 2005, they had an existing business application which they used to monitor hundreds of sewer treatment sites across the country. The application was developed in ColdFusion and Fusebox using Microsoft SQL Server. I began by optimizing the SQL Database and queries and was able to significantly increase response times. I have been the sole support for the application ever since. I have developed many complex applications for them including a chemical delivery calendar which schedules deliveries to sites that are low on chemicals, sophisticated site survey programs, a technician scheduler, and implemented a new layer of security, allowing management to control user access to senstive functions and reports. In 2007 ASAP Rentals in Sarasota, Florida, had a point-of-sale system that did not include a way to automate price book updates. The formats of the files coming in from over a dozen different vendors were not compatible with the price book update function in the software. For years ASAP tried to manually manipulate the files in order to get them to import, but were constantly behind in price updates in the system which cost them thousands of dollars in lost revenue. I developed a custom conversion program in Microsoft Access which would output price files that were compatible with the point-of-sale import program. Each vendor had a unique format, so separate routines had to be written for each. This application is still in use. Tropiflora was operating their business on an application developed in Basic when I stepped to help in 2009. I was able to salvage most of their data from this crippled application and import it into a Microsoft SQL Server database. An order processing application was developed which is currently being used to operate their 6 acre nursery located in Sarasota, Florida. I am currently developing a new e-commerce website which will be fully integrated with the order processing system by way of the shared database and inventory. This new site offers an elaborate shipping and handling algorithm which calculates the cubic space required to ship each order. Accurate shipping and handling was a big concern for the client. The site also features a special program which offers fair distribution of rare plants to customers around the world. The next step in the project is to fully implement inventory control with the use of bar codes and hand-held computers. Beams of Grace is a non-profit orgranization that allows artisans and crafters to sell there products online and contribute a portion of the sale to a charity of their choice. 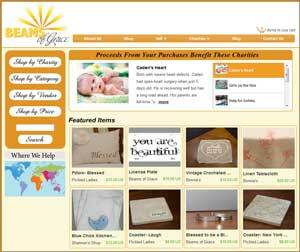 Visitors to the site may also donate directly to the chartiy. This site is fully integreated with PayPal. The home page features a custom animation with rotates through each active charity on the site. 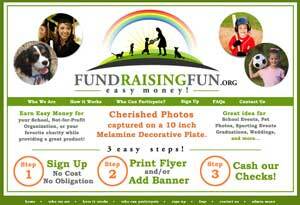 FundRaisingFun.net (no longer in business) sold picture plates as a fundraising tool for non-profit organization. With every plate sold, a contribution is made to the sponsoring charity (see FundRaisingRun.org below). A special feature of this ecommerce site gives the customers the ability to upload, crop, and resize their photos online for their picture plate. Legendary Journeys offers great deals on cruises and cruise tours.Online booking of trips as well as an extensive customer email system have enabled Legendary Journeys to better support their customers and increase sales. The site utilizes a SQL Server database and was developed in ColdFusion. This site was designed over 8 years ago! Legendary Journeys has plans to overhaul the site this year! 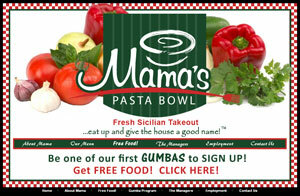 Mama's Pasta Bowl was a restuarant in Lakewood Ranch serves Fresh Sicilian Takout! The site supports online ordering through an integration with FireFly Point of Sale. Tropiflora sells Bromeliads, Succulents, Orhics and other rare exotice tropical plants from around the world. To enhance the custom online ordering application, a complex shipping and handling was implemented that calculates actual cubic size of plants shipping, selects the proper boxes from the database and sends data to Intershipper.com for accurate shipping information. 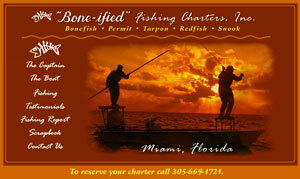 Bone-ified Fishing Charters offers fishing charters in Miami for Bonefish, Permit, Tarpon, Redfish and Snook. The site allows Captain John Dickinson to upload photos taken on his trips and to keep customers updated with Fishing Reports. Both of these application are easy for him to use and update! The site was developed using ColdFusion and a Microsoft Access database. Calisa Poodles Don't these adorable poodles deserve an Excellent Web Page Design? Calisa Poodles has a database driven Scrapbook where they can upload pictures and stories to their site. They also have a dynamic news page, allowing them to post news and announcements to their devoted customers. The site was developed using ColdFusion and Microsoft Access database. 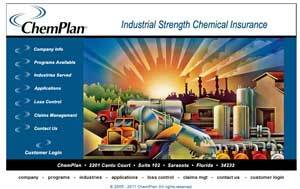 ChemPlan is an chemical insurance underwriter. ChemPlan customers have a secure login area where they can access environment and safety resources for their company. This site utilizes ColdFusion and SQL Server. Denny's Electronics utilizes a Product Catalog to display their fun and amazing amusement games. Denny's is able to showcase their products and update their products page at any time. Flash animation was used to create the home page animation. Microsoft Access and ColdFusion support this application. 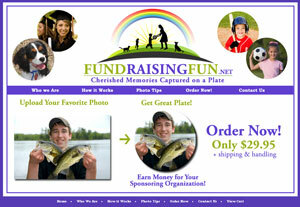 FundRaisingFun.org where non-profit organizations register to recieve proceeds from the sales of picture plates. The site contains a place where these organizations can register and also a secure area where they can login to generate custom PDF Flyers, banner ads and view Sales Reports. 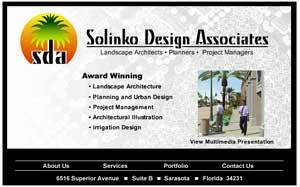 Solinko Design Associates offers award winning Landscape Design, Urban Design and Planning, Irrigation Design, Architectural Illustration and Project Management. This site features a dynamic portfolio area where new projects can be showcased as needed. 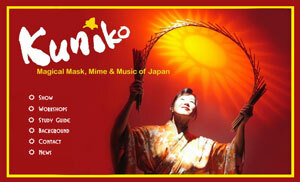 Kuniko Theater offers workshops and shows in Magical Mask, Mime and Music of Japan. A Dynamic News application developed in ColdFusion allowing Kuniko to post News to her site. 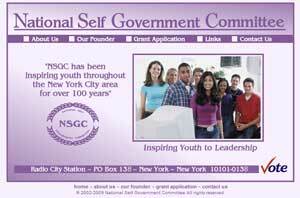 National Self Government Committee offers grants to High School students who wish to pursue projects of social impact.